It used to be that in any fairytale, when the words "true love's kiss" were uttered, it always suggested that the kiss in question would be between a man and a woman. A kiss from a couple who had fallen deeply in love at first sight. That's no longer the case. Disney film stories were the epitome of this "true love" and "love at first sight" scenario. Now I've got nothing against Disney. They make perfectly good films. Really good ones in fact (see: Toy Story, Wall-E, Finding Nemo, etc.). They don't do these films alone of course--thank goodness for Pixar Animation! Still, we have to remember that they also did Snow White. The story of a girl who falls into a deep sleep and wakes up only after Prince Charming kisses her. A prince she saw once, for a few minutes, and doesn't know his name. Then there's Sleeping Beauty. Same story sans dwarves. So it comes as a truly welcome surprise when the last handful of Disney films have negated this tired trope. How do they do this? Well, let's dig in! Maleficent is one of those great--and recently recurring--antagonist origin stories. Much like the Wicked Witch of the West's revisionist origin story, Maleficent is also presented as a three dimensional character, whose life is a far cry from the fairytale. In the original Sleeping Beauty, not much is shown about how or where Maleficent lived or grew. Most importantly we are never told why she became the way she did. She is simply presented as the evil witch of the story. It's interesting to see that in the new film Maleficent she's presented to us not only from a young age (she can't be more than ten at the beginning of the film), but also as a fairy. Her origin story begins as a protector of the Moss, a kingdom bordering a human one, where all types of magical beings live. She's very caring and rather harmless at first. Then she meets Stefan, a human boy who curiously stumbles into the Moss. They form a friendship that turns into young love, during which Stefan, upon Maleficent's sixteenth birthday, gives her "true love's kiss." 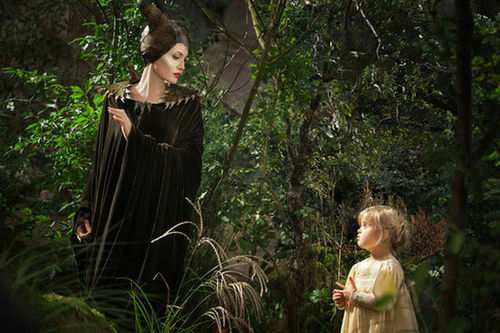 Yet as they grow they drift apart and Maleficent is left longing after him. While Maleficent grows up to be a strong, powerful fae--protector of the Moss. While Stefan is a mere servant tending to a dying king, and thirsty for power. This thirst leads him to betray Maleficent by cutting off her wings, all in order to become king. Such a horrible betrayal could break anyone, and it does break Maleficent. She becomes an overpowering Queen of her own, controlling her domain with a cold hand. This is where fairytale and movie blend a bit. 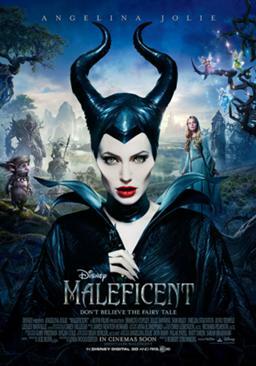 When Maleficent learns of Stefan's new fatherhood, she attends Aurora's christening and curses the poor child, and only "true love's kiss" can save her. A sad and fitting reminder of her own kiss with Stefan. Yet as evil as she seems to have become, she begins to care for the young Aurora. At first only following her from afar and protecting her to a certain extent, and then actually talking to her and creating a bond. While Aurora's real parents have sent her off to be raised by some rather unsuitable guardian faries, Maleficent becomes her surrogate mother. This is a rather great departure from the fairytale in which Maleficent wanted nothing more than to see Aurora die. Here is where "true love" comes in. The curse is fulfilled and it is not the kiss of Prince Charming that wakes her, but the kiss on her forehead from Maleficent. A once spurned and vengeful fairy learns that anger and resentment is no way to live. While some may say that her character was watered down to make her more likeable, I believe that they instead added an extra layer to what was a rather unknown character. Remember wee are told next to nothing on who Maleficent is in the animated movie, so seeing this narrative as her backstory was one I enjoyed watching. 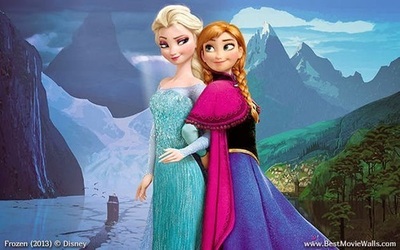 Frozen is one of the few, or perhaps only, fairytale story in which the main characters are two sisters. They might be princesses, but their lot in life isn't all cupcakes and chocolate. Their parents die while both are young and to top it off they haven't really seen each other in years. 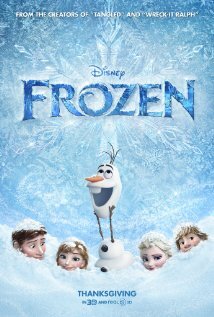 We have this great moment, via song, where we see a progression of years from when Anna is about five to her teen years, and how she's tried to get her sister to "Build A Snowman" with her. Unfortunately Elsa won't even open the door to her room. See Elsa has these WICKED AWESOME SNOW POWERS. Of course she doesn't see it that way. She doesn't know how to control them, and with lack of control comes fear. So of course, she freezes her entire town. Snow has hit the fan. At this moment I thought, "Ok, so Kristoff and Anna are going to fall in love and boom! There's your true love's kiss." It didn't bother me much because I liked both characters and they were quirky enough to be that kind of couple you can envy in a good way. Plus, Hanz was fishy from the start, so he was out. Of course at the end I was pleasantly surprised that it was the sister bond between Anna and Elsa that saved them. Sans a kiss of course, but the meaning is there. So what am I trying to say with this whole spiel? Well, that I am thankful "true love's kiss" had a deeper meaning in these stories. Ok, getting a kiss from a prince is cool and all, but the way it was portrayed in fairytales was rather superficial. Where's the meaning? It's a stranger kissing you while you're asleep. Creepy? I would think so. I'm not saying that love between two sisters, mother-daughter or any two women for that matter is stronger than that of a man and a woman--far from it. All I'm saying is that if you're going to sell me a Prince Charming, let me get to know the guy first. As for these two movies, I liked their take on love, and that's where these stories differ so much from the tried and true fairytales of yesteryear. The characters who are saving one another with "true love's kiss" are people they actually know. A mother, a sister. They are people who care for each other, who have know each other for years, and the love is unconditional. That's the kind of meaning I like. One that is realistic and relatable. I like the fantasy elements, but that at its hear it is a human story--an emotional one. Perhaps I'm asking too much, but I hope that movies continue to be like this. Movies that create situations that are emotional and compelling; but most of all one that I can relate to.